Forest Park's Brandon Daniels challenges the shot of Freedom's Kishaun Kimble in the second half Thursday night. The Forest Park Bruins can now relax a little bit–for a day or so anyway. 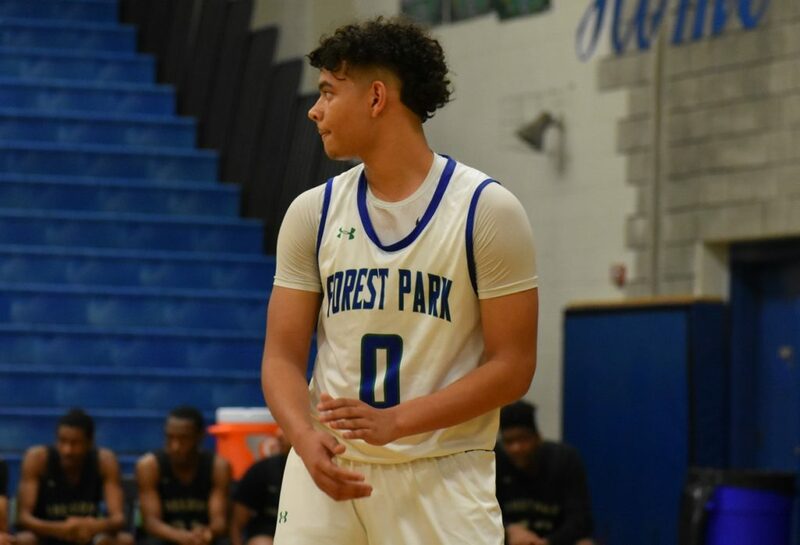 Thursday night junior Kevin Johnson and senior Darryl Garib scored 16 points apiece to lead Forest Park to a 68-59 victory over Freedom-Woodbridge. The victory was the Bruins’ fourth in four nights, and it locked up second place and the #2 seed heading into next week’s Cardinal District Tournament. 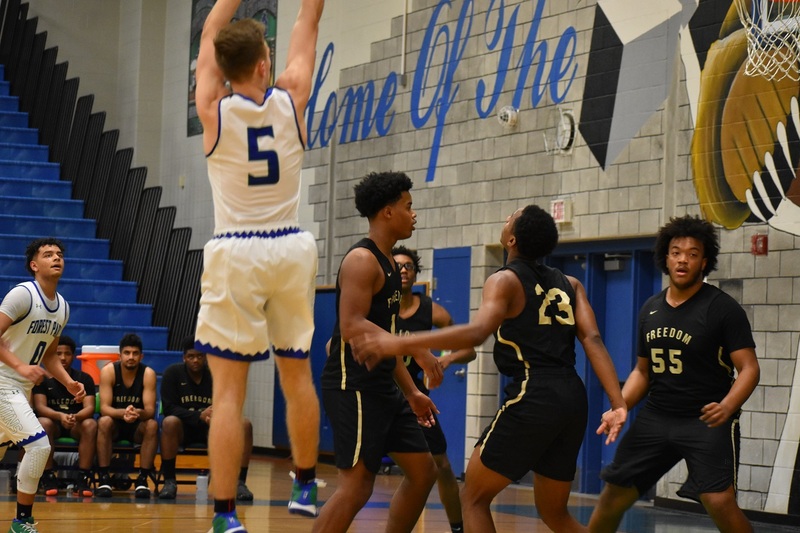 The Bruins had beaten Woodbridge, Colgan, and Hylton leading up to the game Thursday. Freedom represented the biggest challenge of the week, because the Eagles had beaten Forest Park earlier in the year and would have passed Forest Park in the standings if they had won. Kevin Johnson (16 points) buries the jumper over the Freedom defense. This was the Eagles’ third game in three nights. Perhaps because of the heavy workload this week it took a while for both offenses to get untracked. Freedom led 9-7 after one quarter, then Forest Park started to pull away. Johnson, who came off the bench as the Bruins honored their five seniors by starting them all on senior night, sparked the offense with nine total first half points. At the break the Bruins led 23-19. The Bruins doubled their 23 points in the third quarter alone, with a 14-3 run midway through the quarter breaking open a 27-27 game. They started to force turnovers and get in transition. Despite a lackluster shooting night from beyond the arc (21%), they were also able to get to the rim in the half-court. Garib was a big factor, scoring 14 of his 16 points after halftime. 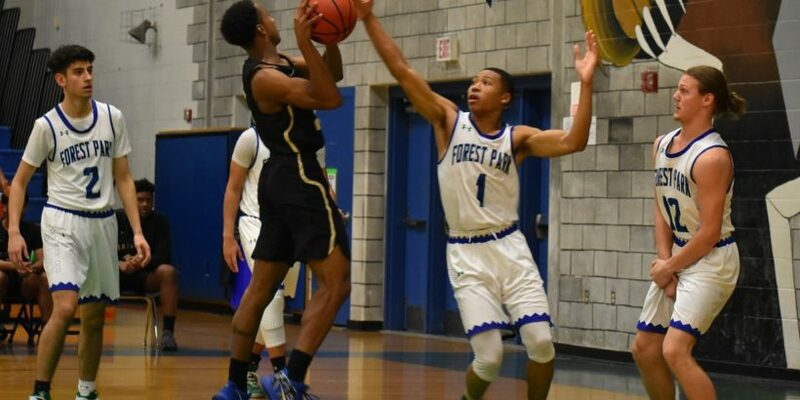 Forest Park senior Darryl Garib had 14 second half points to spark the Bruins. Now down double-digits after three quarters, the Eagles wouldn’t go away. A Nicholas Jones driving lay-up cut the Forest Park lead to 50-45, but momentum was soon squashed when leading scorer Caron Forde fouled out shortly thereafter and an Eagles player received a technical. Farzan Gill buried a three to cut the lead to 62-55 with just over two minutes left, but that was as close as Freedom got. Forest Park (9-3, 11-10) got strong contributions from a number of players. Diego Cobb had eight points and 11 rebounds, while fellow senior Brandon Daniels had 13 points and six rebounds. The Bruins played 11 players on the night and their depth was obviously a factor in keeping the team undefeated through its tough stretch this week. Freedom (7-4, 9-11) was led by Forde’s 14 points, with Gill adding 13 points–11 in the second half. Senior Kishaun Kimble added 10 points. The Eagles will play their fourth game in four nights tonight, when they host Colgan. Forest Park will next be in action in the Cardinal Tournament.